The Little Angels, the Korean Children’s Folk Ballet troupe, came to London on October 2nd 2010 to bring thanks to those British veterans of the Korean War on the 60th anniversary of the outbreak of that conflict. It was a poignant occasion of exquisite art and tearful remembrance. 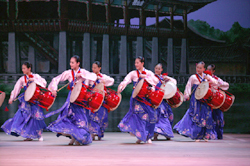 Attended by many Ambassadors for Peace, diplomats, political and religious figures, Sadler’s Wells was full with many newcomers to Korean culture in both a matinee and an evening performance. The audience was captivated by the grace and dignity of the young performers of Korea’s foremost art and culture school. Photo link here. Video Link. The Universal Peace Federation was asked to support the tour’s visit to the UK. It was gratifying to see many of our old friends from a variety of national and ethnic backgrounds enjoying the traditional culture of Korea.